both published by Wilmington Square Books, an imprint of Bitter Lemon Press, 2017. 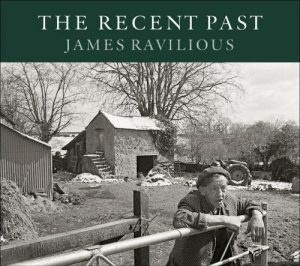 Nearly twenty years after his untimely death, the reputation of James Ravilious as one of the greatest photographers of English rural life continues to grow. His remarkable body of work, recording the daily life of a small and relatively remote part of the north Devon countryside between the rivers Taw and Torridge between the 1970s and 1990s, is now recognised as a major contribution not only to the recent history of Devon but more widely to the cultural history of the English countryside in the later twentieth century. These two volumes, published contemporaneously because they so fittingly complement each other, are major additions to the already quite considerable collection of Ravilious’s published work. Both owe much to James’ widow Robin who has worked indefatigably to promote the appreciation of her husband’s legacy. She contributes a perceptive and illuminating introduction and captions of perfect pitch to The Recent Past, a splendid collection of seventy five of Ravilious’s most brilliant images drawn from his recording work for the Beaford Archive, an innovative project conceived by the Beaford Centre’s founding Director, John Lane. Many of these are familiar from previous publications but here they are reproduced at [mostly] larger scale and in landscape format, and almost all benefit from the greater resultant clarity. They enhance appreciation of Ravilious’s mastery of his beloved black and white medium which he considered ‘more profound’ than colour: this comes over again and again in this selection, of sublime visual impact as well as superb technical quality. They portray rural life with immediacy and intimacy, eloquently expressing Ravilious’s own warm humanity and his genuine love and admiration for the people and their lives who were the subjects of his kindly, sometimes amused, but always appreciative eye: image after image is movingly tender, but without a hint of sentiment. 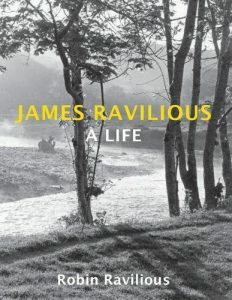 Robin’s biography James Ravilious – A life is a truly remarkable achievement. One can only admire the way in which she skilfully combines love and affection with clear-eyed objectivity about her husband. She offers new and important background to his early life and the development of his artistic personality. The influence of, and his childhood loss of, both his parents – Eric Ravilious and Tirzah Garwood, both major artists in their own right – combined felicitously with his marriage to Robin, the daughter of Laurence Whistler the glass engraver and Jill Furse the actress, whose family had deep roots in the countryside around Dolton. It was Robin who brought James to the small cottage at Addisford near Dolton in the 1970s that was to become the hub of James’s work as well as family life. Fascinating insights into James’ way of working in the creation of the Beaford Archive enhance one’s appreciation of the sheer slog involved in the creation of his apparently effortless images as well as the challenges to family life arising from his tireless pursuit of perfection and dedication to his mission. Robin quotes Olive Cook’s pellucid description of James as ‘…of quite exceptional acuity and patience of witness and of quite unusual humility and warmth of spirit.’ Just so. When I was working with James, towards the end of his life, on another selection of his images, I noticed he had written on the reverse of many of his prints ‘Can- and must do better!’, a reprise apparently of a schoolmaster’s frequent comment on his schoolwork. No one can say ever that of this fine brace of books.